It’s impossible to say that fried rice is native to one cuisine because so many cultures have different versions of it. It’s basically what many people do with their leftovers—whatever vegetables, meat, and rice happen to be on hand go into the wok. This is one version that we like, with plenty of oyster and soy sauce. I use leftover rice when making fried rice because that day or two of resting in the refrigerator makes it stand up to the heat of the wok better and not get mushy. I prefer brown jasmine rice for this dish, but you can choose another type of long grain rice. Place a wok over high heat until hot. Add the peanut oil, swirling to coat the sides. Add the garlic, ginger, and onion. Cook until the onion is soft, about 30 seconds. Add the carrot, celery, and broth and stir-fry for 2 minutes. 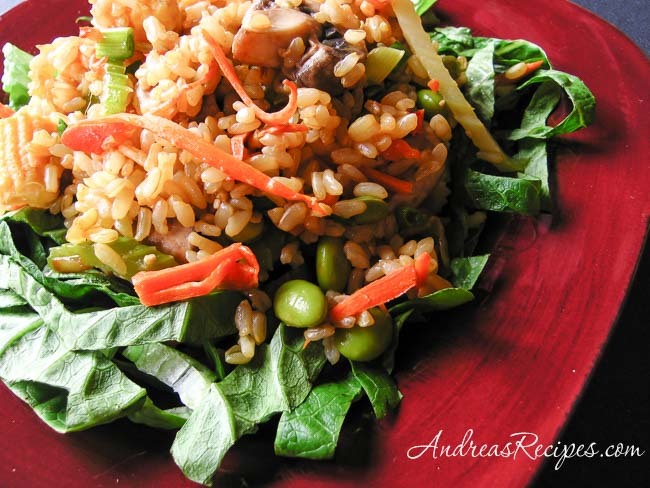 Add the baby corn, green onion, peas, mushrooms, and rice, separating the grains of rice with the back of a spoon. Stir well. Stir in the pepper, soy sauce, oyster sauce, and sesame oil. Cook until heated through, about 2 minutes. Serve garnished with shredded lettuce.